Sometimes you may feel that in order to have a beautiful home you need to spend a great amount of money. You may think that in order to do a makeover you need to be an expert. but never actually taking the chance to hold a paint brush, or a power tool in your hands. Should you give your own creativity some credit and do something with it? 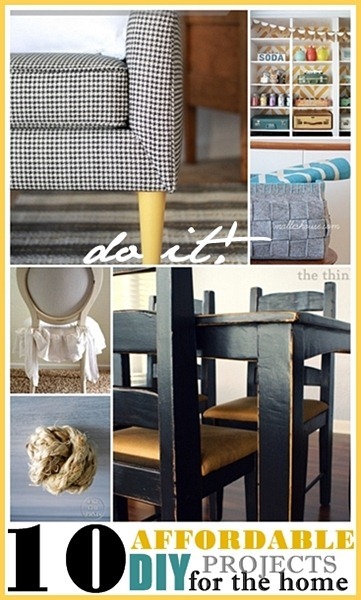 you take a chance and make small changes that will have a great impact on the look and feel of your home. Give your furniture a bit of attitude with an accent color. 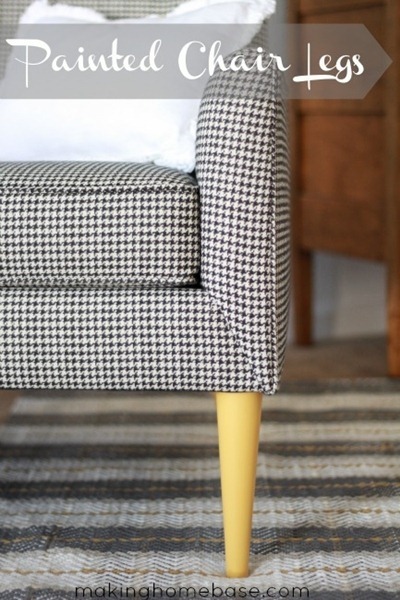 I love how my girl Chelsea from Making Home Base painted the legs of her chair to give it a pop of color. 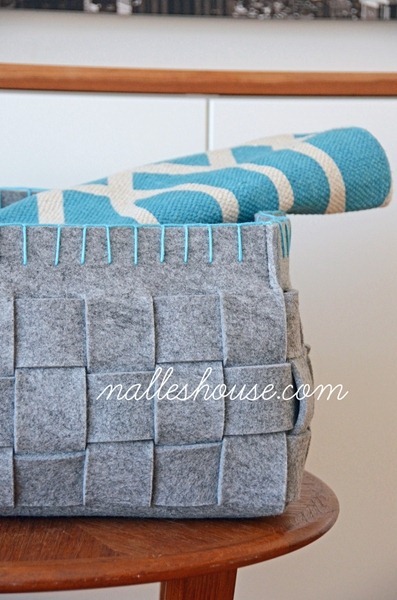 I also really like how Anu from Nalle’s House embellished this felt basket. Nothing like putting your personal touch! Check out how awesome these bookcases are by my sweet friends from Lolly Jane. 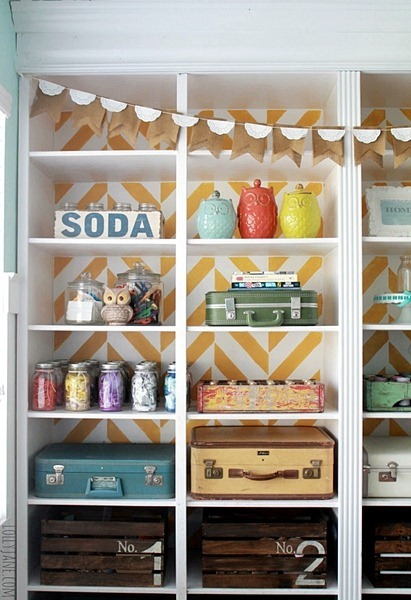 The accessories and the white and yellow herringbone pattern in the back of the bookcases are fantastic. What a fun way to incorporate color in a little girl’s room. 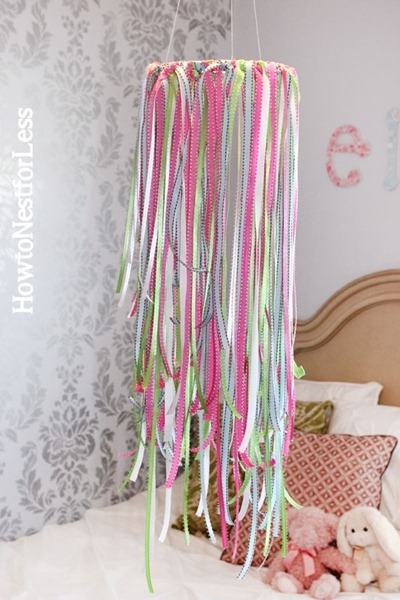 I adore this ribbon mobile by Erin from How to Nest for Less. 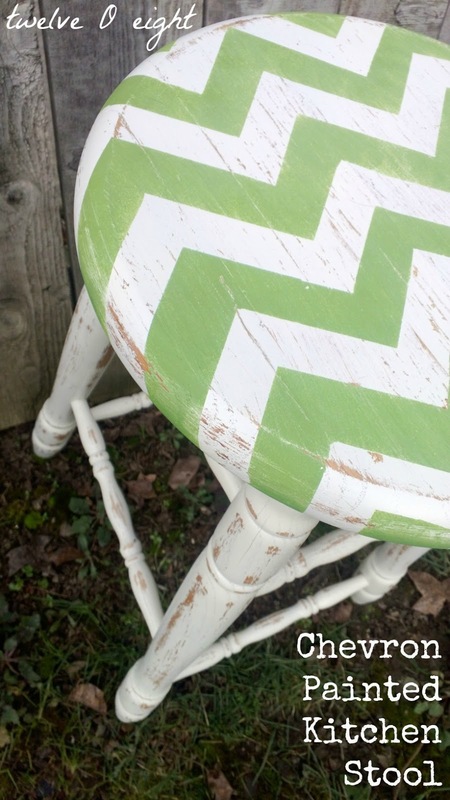 Twelve O Eight gave her barstools a little chevron love. Oh how I love green! Lauren from The thinking Closet gave her not so exciting table a fantastic makeover. This black distressed finish made all of the difference. You got to love paint! 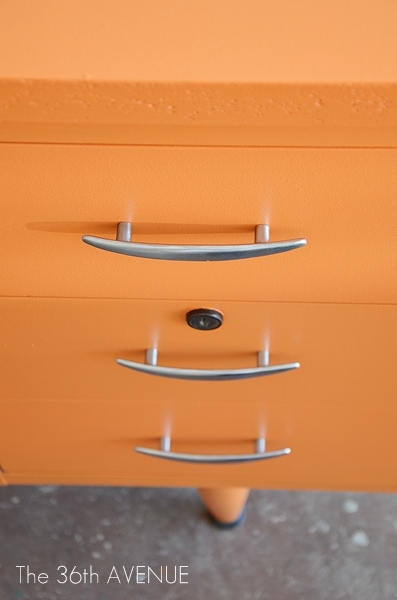 How cool is this cabinet from The Golden Sycamore? I am in love with numbers. 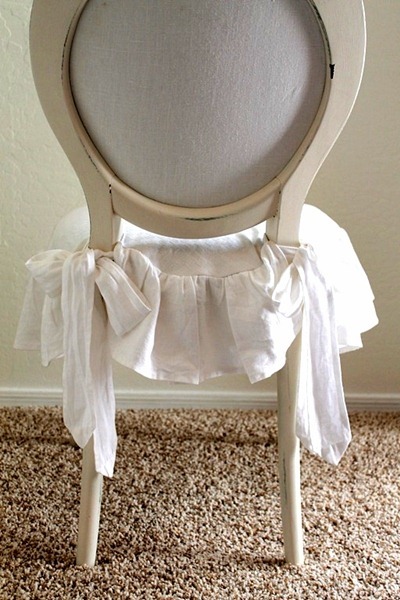 Laura from Décor to Adore made this gorgeous slipcover from a dishtowel. This shows you how been thrifty can also be adorable. Knobs and handles can cost you a fortune. 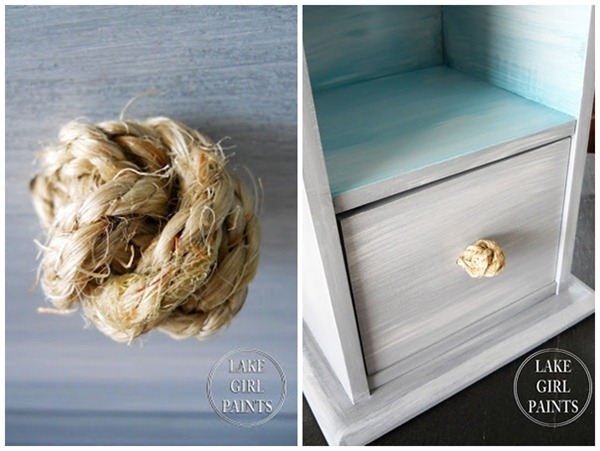 Super talented Deb from Lake Girl Paints made these easy to make Jute Rope Handles. Come on! You have to go and check out this tutorial. I am finishing with this fantastic boy’s bedroom makeover by one of my favorite people on earth. 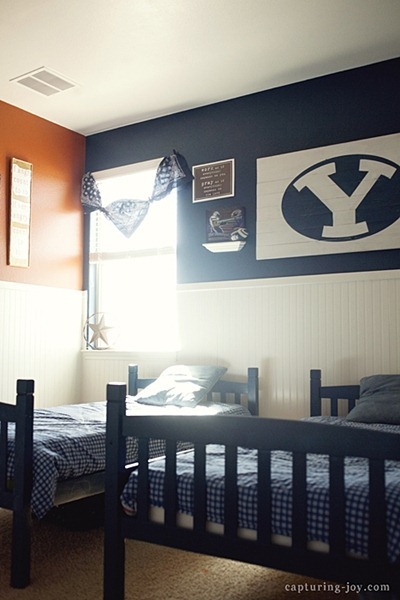 My dear friend Kristen combined navy blue and orange to decorate her boy’s room. This bedroom is awesome… make sure to stop by Capturing Joy to see the full makeover. This is why I love our link party. I get to see so many incredible projects every week that surely inspire me. have made our own house our home. 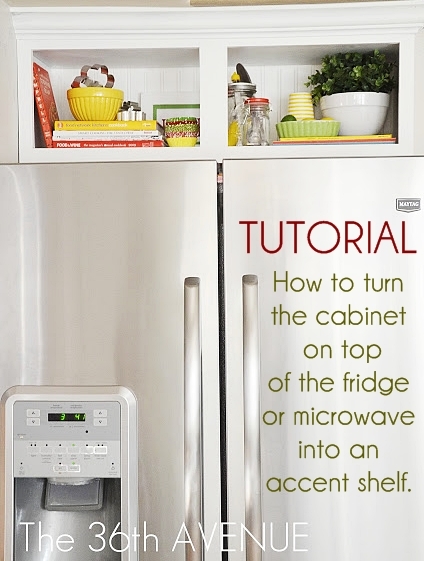 Here you can see how to turn the cabinet on top of your fridge into an accent shelf. Can you paint laminated particle board? Check out here how to do it. 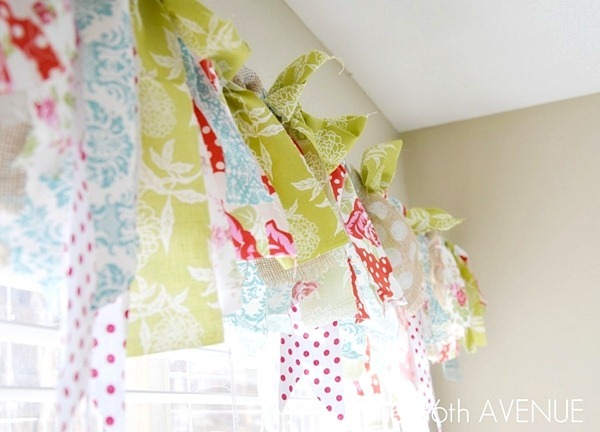 And here learn how to make an adorable no sew window treatment. Who needs a sewing machine when you have a good pair of scissors? Please go visit your favorite links. Remember that behind those pictures are real women that believe in the power of creating. 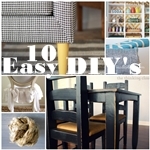 The furniture makeovers, the affordable tips, and the décor ideas are simply genius. Go say hi, thank them, follow them, and have fun! Love you guys to pieces. I am not so “crafty” but there are TONS of things I want to do on your website. Thank you for putting things up that look easy enough for even someone like me to try! I am SOOO enjoying the things on your website!!! Happy Easter and thanks for not forgetting the Reason we celebrate the holiday!! Desiree I have had house guests for the past few days so I am a bit late in saying “Thank you for the feature!” Wow I feel so blessed. Awsome budget friendly projects! The knobs are so cool – and Thanks for giving me the guts to try paint my laminated dresser 🙂 have a lovely day! Love everything here, especially the no-sew curtains and the pretty green chevron chair! what a fun surprise!!! thanks for sharing my boys room, they do love it and that makes me so happy!!! 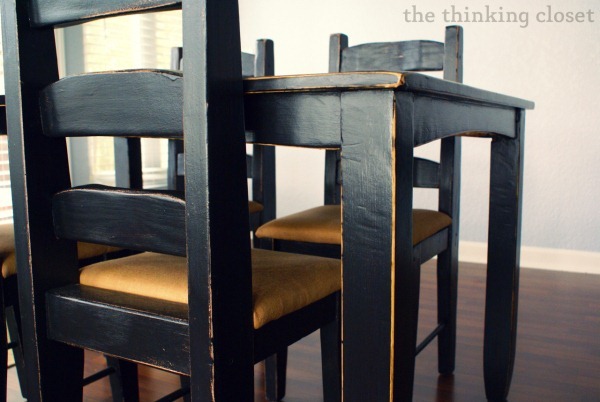 Thank you so much for featuring my black distressed table makeover! It’s truly an honor to be included in this awesome round-up.